Bulls Executive Vice-President of Basketball Operations John Paxson Saturday confirmed Chandler Hutchison officially will join fellow rookie Wendell Carter Jr. who is out for the rest of the season. Plus, Paxson said Otto Porter Jr. with shoulder and neck issues possibly will not play these last three weeks, and Zach LaVine, who sat out Saturday night against the Utah Jazz, also could be out the final nine games. Though coach Jim Boylen said it is not a ploy to enhance draft lottery positioning. "That's not what we think is going to help this franchise the most," Boylen told reporters before the game. "We're trying to build a competitive spirit, a team that's going to honor Bulls across their chest and play for the city. We don't feel shutting people down is a way to build that. I understand the fans (some favoring losing); I understand that part of it. I was in Houston when we got Yao (Ming with the No. 1 draft pick). So I get it. But we feel for this group of guys that we're going to keep pushing us to compete and play for each other and honor the principles we're trying to establish. I know that's disappointing to some, but that's what we're doing." Still, it means you're going to see plenty of Shaquille Harrison and Antonio Blakeney, the latter who started against the playoff bound Jazz, along with Wayne Selden Jr., Cristiano Felicio, Timothe Luwawu-Cabarrot and a dash of Brandon Sampson. The Jazz didn't seem to mind as they dominated the Bulls 114-83 in a game that was pretty much concluded by a 17-0 Utah second quarter run that gave the Jazz a 68-30 lead shortly before halftime. Not that it ever was particularly competitive with Boylen calling two timeouts in the first seven minutes of the game with the Bulls in full lollygag mode and Utah leading 33-18 after one quarter. "Obviously, when you dig a 36-point hole or whatever it was, it's kind of hard to come back from that," said Lauri Markkanen, who led the Bulls with 18 points and 10 rebounds. "You gotta compete every night no matter who you're playing against, and I don't think we did that in the first half. And that's pretty much the storyline. I think we can beat anybody when we play a full 48 minutes that well. We haven't done that too many times this year. We just gotta pull together, and I think we did a pretty good job in the second half." The Jazz pretty much were coasting after making their point, and their points, in the first half. Not that it should have been unexpected with the Jazz in a narrow competition with three other Western Conference teams to at least avoid the Golden State Warriors in the first round of the playoffs. The Jazz, Thunder, Clippers and Spurs are virtually even in the race for the Nos. 5 through 8 places. They're pretty much assured of making the playoffs with the Kings in ninth six games behind. But the Jazz was taking no chances with a Bulls team, though now 21-53, that had won two straight, including overtime against Washington. What the Jazz demonstrated is what a playoff team looks like. And for the Bulls, at least for now, what a primarily G-league team looks like. 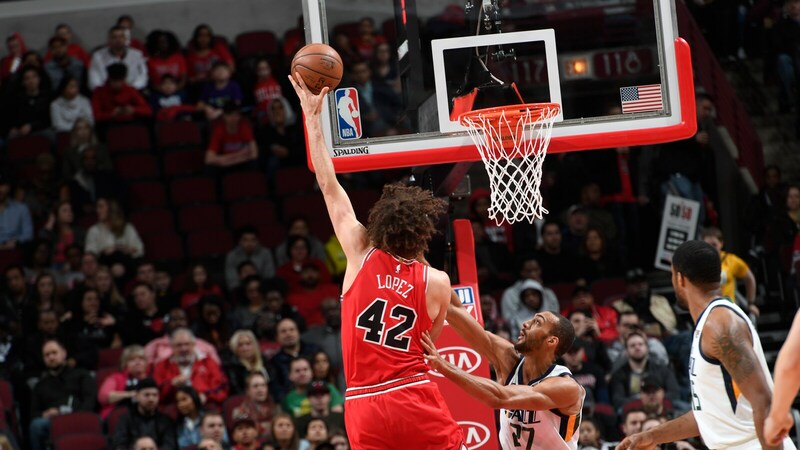 Other than Markkanen, the Bulls got 10 points each from Robin Lopez, Blakeney and Felicio, the latter with his third consecutive game scoring in double figures. Kris Dunn was listed as questionable with a back problem, but he asked to play with Porter and LaVine out. "I love the fact that he tried it. He had more kinesio tape on him than a damn mummy," said Boylen. "He tried to play and give us what he could. I love the fact that he just said, 'Coach, I'm gonna give you everything I have. I'll do the best I can.' And he tried. I like guys like that." But the Bulls never really had much of a chance against one of the league's best defensive teams with defensive anchor Rudy Gobert leading seven players in double figures—and no one playing 30 minutes—with 21 points and 14 rebounds. And not only by the defensive numbers for Utah, second in the league in defensive efficiency to the Bucks. The Jazz don't switch as much as most teams, playing an aggressive, physical man to man defense and fighting over screens. Boylen before the game likened the Jazz to a 90s type NBA team, and it's not something teams see often. The Bulls clearly were overwhelmed. They repeatedly tried to go at Gobert early with indifferent scoop shots, which he swatted away. The Bulls also would equal a league low this season with just two three pointers made. The Jazz play a defense similar to the way the Bulls played with Tom Thibodeau, funneling drivers to the baseline to their big man. The idea is the baseline and sideline provide a form of a trap and the Bulls players seemed flummoxed with 31 percent first half shooting. It seemed to take the fight out of them with that 17-0 run filled with layups and lobs as Utah also is excellent, if somewhat star deprived, at moving the ball with precise extra passes. "I thought Gobert and their defense shut down the paint," said Boylen. "We were two for 16 from three, so obviously we didn't help ourselves there. I thought they made some contested shots early and then the dam kind of broke in that second quarter. We were not scoring and they were scoring. That's a bad combination against a good team. If you want a bright spot, we won the second half." Though the news, if not so bright, came prior to the game with Paxson, who admitted Hutchison could not make it back from his toe injury with so few games remaining, and perhaps not Porter, either, considering the time needed to practice. 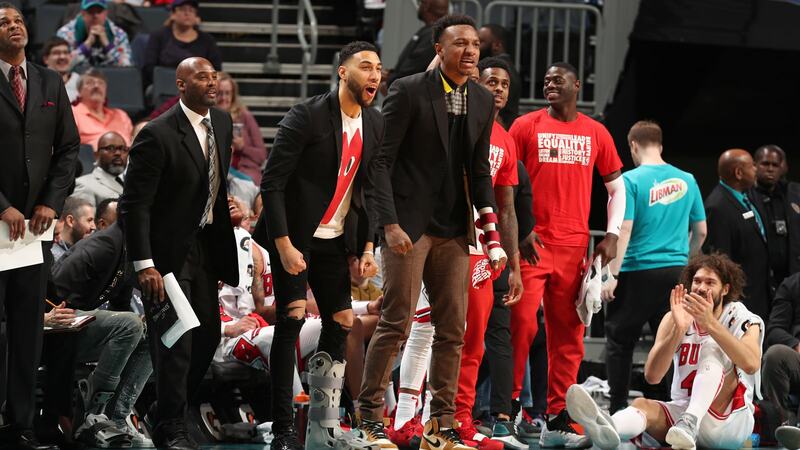 Plus, Paxson indicated it's possible LaVine doesn't make it back from some knee issues, though he and Porter aren't ruled out for the season yet. This, of course, raises questions about draft lottery positioning, though it could be moot by now. With Atlanta's surprising win over the 76ers Saturday, the Bulls are now five games from the Hawks, who have the fifth poorest record. With just eight games remaining, the Bulls almost certainly cannot end with a better record than Atlanta. That leaves the Bulls in that fourth spot. The three poorest teams get the identical 14 percent odds for the No. 1 draft pick. No. 4 has odds of 12.5 percent. The Knicks and Suns have pretty much clinched the bottom two records. The Bulls are one and a half games better than Cleveland, which is in the third spot. Though six of the Cavaliers last nine games are against teams in playoff positioning. The Cavaliers have one more loss than the Bulls. If the teams tie, there is a procedure to average the number of combinations of the two teams and then a coin flip if it's not a full number. Last year, the Bulls "won" the coin flip with the Kings to get the No. 6 spot and Sacramento No. 7. Then No. 7 came up to move into the top three, the Bulls good luck turning bad as the Kings moved to No. 2 and selected Marvin Bagley. Which also suggests all that maneuvering could be for naught if a team is not lucky, which the Bulls were not last season despite "winning" the coin flip. "Chandler had another scan and he continues to progress really well, but we're officially ruling him out. We've kind of run out of time where it makes any sense to bring him back to try to play at the end of the year," Paxson admitted. "Wendell has amped up his activity and we've mentioned it, but we're officially ruling him out for the year as well." Hutchison, the No. 22 pick last June, finishes the season playing 44 games, averaging 5.2 points and 4.2 rebounds. But he finished the season averaging eight points and six rebounds in January. Carter averaged 10.3 points and seven rebounds, also playing 44 games after being drafted No. 7 overall. "The only other two guys we are monitoring are Otto and Zach," Paxson said. "Otto has had a lot of little nagging injuries that we're trying to pay attention to and Zach has that patellar tendinitis that he's been dealing with. We're going to monitor them on a day-to-day basis. The discouraging thing (with Hutchison) he was kind of coming into his own a little bit when he got hurt. The things Chandler does well are his ability to rebound and push the ball. He's another creator. He's going to have to spend time in the gym shooting the ball this summer to become a better shooter because we know that's an important component. But he has size and length to defend. We're encouraged. The summers are always important for him, and for Wendell it will be a huge one. Wendell has to work on his body, get stronger, more physical. What he probably learned as a starter this year is some of the big bodies he goes up against every night can be difficult. (Orlando's Nikola) Vucevic comes to mind for a couple of games that were physically difficult for him. He's 19 years old. We need him to be in the weight room working. We're anxious to see how he works this summer. "Otto has so many little things going on that we won't push him," Paxson acknowledged. "We may run out of time with him, too. For Zach, I think it's important for him to try to fight through some of these little things. Last year, we shut him down toward the end (last 14 games). If Zach's patellar tendinitis doesn't get appreciably better in the next week, then you start looking at the reality of it and it doesn't make any sense (to return). But we're not there yet. "We're going to be adding at least one player in the draft, probably two (with a second round pick from Memphis)," Paxson added. "It's going to be a huge summer. You factor in other guys. Denzel (Valentine) has been out the whole year, so it's going to be a big summer for him, too. (Porter) has had some nagging things throughout his career. We're aware of that and we're going to monitor it. Right now, he hurt his shoulder and his neck has been bothering him. It seems like it's been one thing after another. For a guy like Otto and his longevity as a player, the offseason becomes important as far as establishing a base with your strength and conditioning. We're not ruling him out completely yet, but it's kind of trending that way."